Sofitel Angkor Phokeethra Golf & Spa Resort is home to some of the best restaurants in Siem Reap, offering quality and diversity across all of our eateries. A part of the top 10 of the best buffet in Siem Reap, The Citadel is the perfect place to enjoy international flavors. The grounds boast stunning landscapes, ideal for any drinking or dining occasion including early mornings, afternoon sunsets, and moonlit dinners. The availability of outdoor venues make our resort perfect for al fresco dining, ideal for enjoying the crisp morning air over a hot cup of coffee or sipping on cocktails in warmth of the setting evening sun. The Citadel is one of the resort’s most popular restaurants, offering all-day dining options that include a la carte choices and extravagant buffet selections, making it an ideal spot for anyone searching for the best restaurant Angkor offers. The restaurant takes pride in its vibrancy, authenticity and freshness, and always promises guests something new and exciting. As a top restaurant Siem Reap takes pride in, The Citadel serves eclectic International cuisine that combines the best of the East and the West. In the mornings, the restaurant serves up the best breakfast buffet Siem Reap offers, treating guests to an array of delights that include delicate homemade pastries, eggs cooked fresh to order at one of the many exciting live cooking stations, fresh exotic fruit, and an extensive range of other delicious choices including wholegrain cereals, muesli, cold-cut meats, cheese and other nutritious choices to help you start the day off right. The breakfast buffet also features traditional Cambodian fare, and other light Asian inspired dishes for those seeking something different than continental choices. But the excitement does not stop there, as an all-day dining venue The Citadel also offers sumptuous a la carte choices for lunch and dinner to ensure a relaxed and delicious meal at your own schedule. The menu is decorated with choice, ranging from rich and hearty Asian curries like the Yellow Dhal Curry cooked with local market vegetables, exciting stir fries and traditional noodle dishes such as the ever-popular Phad Thai. The menu also features a selection of delicious Western inspired dishes, such as the moist Lamb Shank served with polenta and juicy King Prawns and Calamari on a bed of spicy Tagliatelle in tomato sauce. The diversity of the menu also offers options for all types of diners including vegetarians, vegans and individuals who prefer gluten-free dishes. Under the stars the night comes alive with The Citadel’s exciting night-time dinner service, which includes the best dinner buffet Angkor has seen, dishing up exciting international delicacies with something to suit all taste buds. 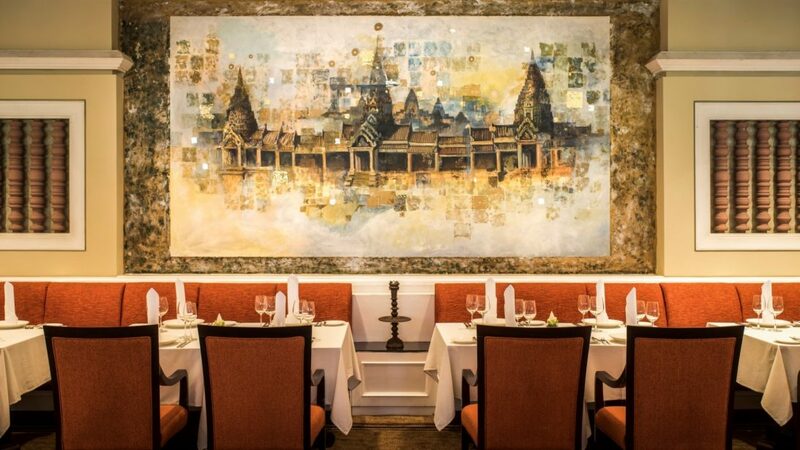 The restaurant’s décor and design are also a nod to its international flavour, combining the best of Khmer inspired architecture with the elegance of French dining. The restaurant’s space is also incredibly versatile, offering the choice of indoor or al fresco dining. Guests can choose to sit in the comfort of the cool air-conditioned dining room or enjoy the warmth of a tropical night outside on the terrace while gazing upon the lush surrounding gardens.